Anytime you embark on a strict dietary protocol, odds are, you’re going to miss your favorite foods. For most people this includes bread, sugary treats, and the like. For me, it’s sweet potatoes. 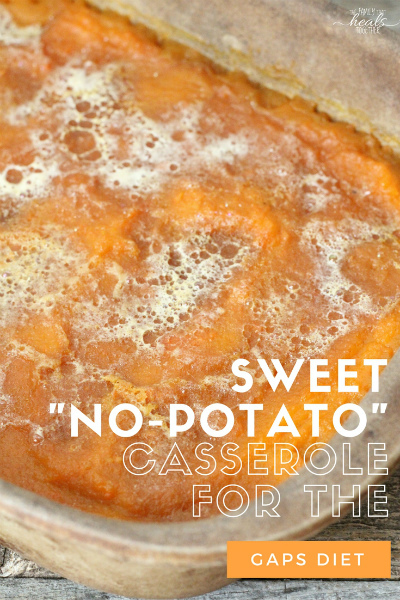 This sweet “no potato” casserole makes me miss them a whole lot less. You may be wondering what kind of a dietary protocol would require eliminating sweet potatoes. After all, aren’t they a health food? While sweet potatoes have tons of health benefits, for those with compromised gut health, they may pose some problems. Sweet potatoes are starchy and can feed pathogenic bacteria and fungi. That’s why they are excluded on the GAPS (gut and psychology syndrome) diet, an intensive gut-healing diet which requires the removal of grains, sugar, and starchy foods, instead focusing on meat stocks and broths and probiotic-rich foods like sauerkraut and milk kefir. The diet can really benefit just about anyone, as most of us have symptoms of gut problems, whether big or small. From occasional seasonal allergies to autism, compromised gut health can manifest in any number of health conditions. The GAPS diet heals and seals the gut lining and promotes the growth of beneficial bacteria in the gut, improving digestion and eliminating a leaky gut. 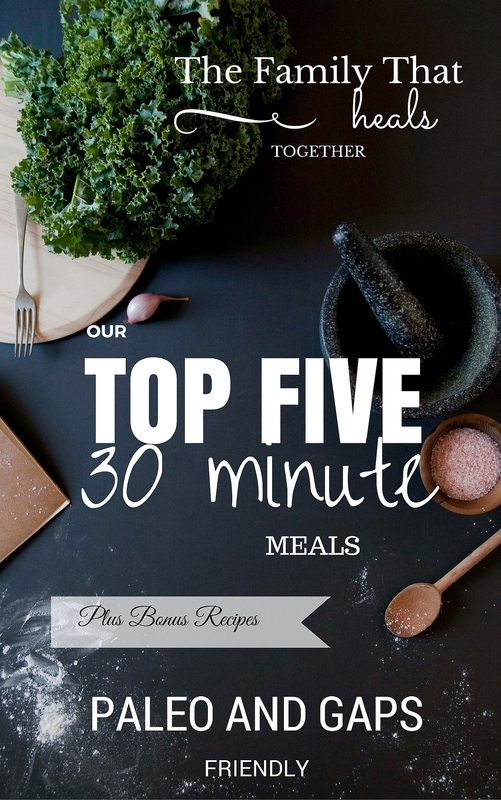 Our family was on the GAPS diet at the holidays last year, and we experienced so much healing! My son has recovered from behavioral disorders, and I have recovered from symptoms of Lyme disease, like chronic fatigue, joint pain, and lots more. GAPS was a huge step in healing for both of us. The rest of our family has experienced tremendous healing thanks to GAPS as well, including healing from eczema, minor digestive issues, and overall health and well-being. It’s just such a comprehensive healing protocol. If you’re on a restrictive diet, you may be worried about the upcoming holiday season. What will you eat? Will you stay committed to your health and healing? Will you compromise? I found myself asking those same questions last year, and I determined that not only would I stick with GAPS, but I refused to feel deprived. With a little creativity, I remade all of our favorite holiday foods with ingredients we could eat. I got down to business, and we got to enjoy the holidays, strict diet or not! You can enjoy healthy holiday foods, too! If you’re wondering how you can stick with your healthy diet and still enjoy the holidays, you’re in luck- I’ve created a resource that I know you’re going to love! 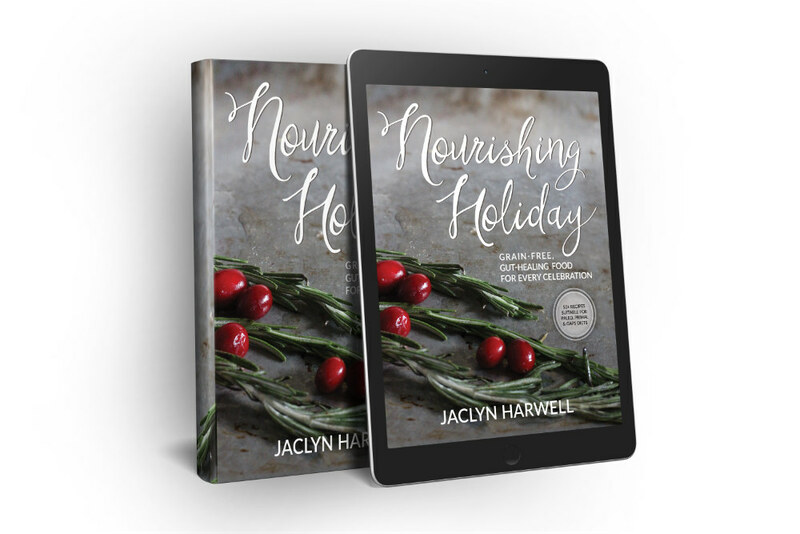 My new e-book Nourishing Holiday is the perfect cookbook for those on grain-free diets like GAPS, primal, and paleo. With over 50 gut-healing recipes, you can have your grain-free cake and eat it too! 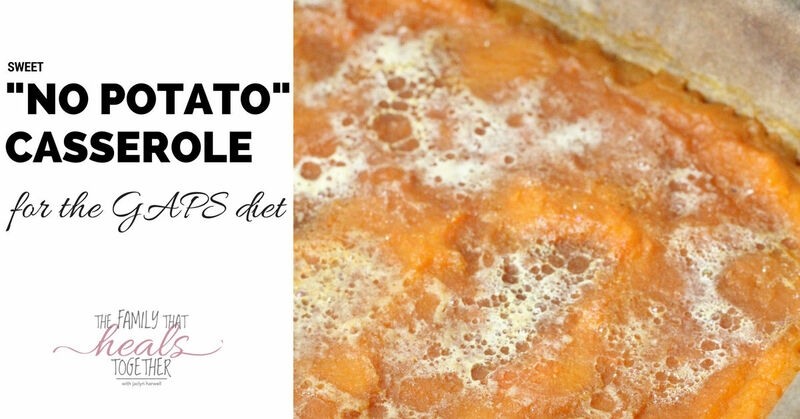 Since I know you’re going to love every recipe that not only nourishes your body and makes sticking with a healthy diet through the holidays possible, I wanted to share a recipe for you, one which I’m pretty proud of: Sweet “No-Potato” Casserole.” It really does taste like sweet potato casserole, minus the sweet potatoes! Enjoy the recipe below, then be sure to snag a copy of Nourishing Holiday! Grain-free holiday cooking never tasted so sweet. Combine veggies in a large saucepan and fill with water. Place on the stovetop over high heat and boil for 20-30 minutes, until soft. Drain vegetables and transfer to a large bowl. Transfer to a large casserole dish and smooth with a spatula. Top with marshmallows, then place in the oven for 20 minutes. Homemade marshmallows melt more easily than store-bought. They still taste amazing!